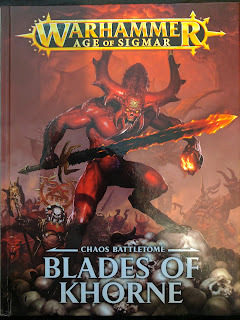 I’ve been rather fortunate and have been given a sneaky peek at the new Chaos Battletome for Age of Sigmar called “Blades of Khorne”. 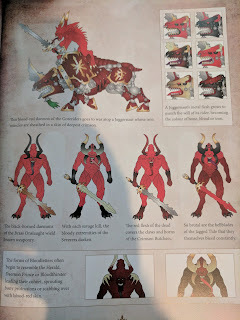 I’m quite new to the scene in regards to Age of Sigmar but if like myself, you got the starter set and you preferred the Khorne Bloodbound over the Stormcast Eternals and you were wanted more thematic rules for them or alternatively some direction in how you could expand your army then this is the book for you. If you are in a similar position with a Khorne Daemon army, this book is perfect for you too. This book is very much focused around Khorne Daemons and Bloodbound – no Chaos Warriors things included in here I’m afraid! 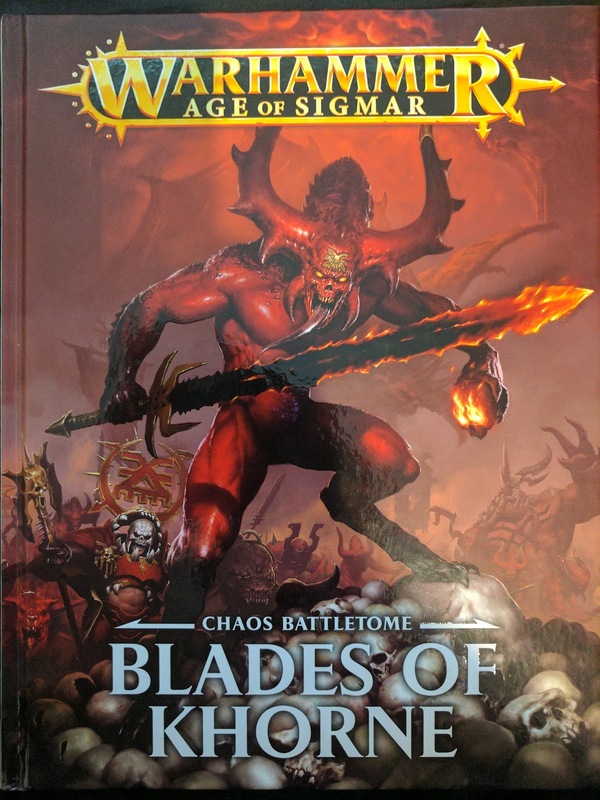 You can very easily use this book purely for Khorne Daemons and likewise for Khorne Bloodbound but this book gives you boons for mixing it up a bit and having a combined force of daemons and mortals fighting side by side in the name of the Blood God. The lore sections are really nice. It covers both Khorne Daemons and the Khorne Bloodbound – in both cases giving an overview of both organisations such as how there are structured and things of note such as the rise of Korghos Krul before digging into more specific bits like the role of the Gorechosen. 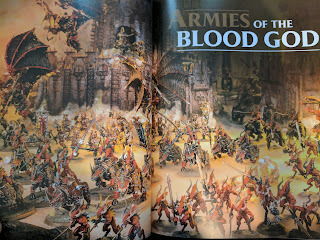 I have enjoyed reading these sections and I would loathe to spoil it for you and for you hobbyists, you will find the usual warband colour scheme pages for you to get an idea on how you could paint your horde. If any of you are familiar with the Khorne Daemonkin codex for Warhammer 40000 and how it worked, you will find some of the rules contained Blades of Khorne are very similar in theme and I feel that is a good thing. Both books give you some very nice Khorne-based bonuses that really add that little bit extra to your army that make it feel really thematic! For example, for any unit that has been wiped out (either yours or your opponents), you gain a Blood Tithe point and you can spend these in the Hero phase (yours or your opponents) for various bonuses and effects – as you might expect, the more points you spend, the more powerful the ability and I am sure you will not be disappointed! There are artefacts and gifts that mortal/daemon heroes may take much in the same way as you could give relics to characters in Warhammer 40k. There are also new blessings for priests in your Khorne based armies to use. There are a few battleplans and expanded rules for Path to Glory for your Khorne warband – won’t go into too much detail here but there are some very nice bonuses you can gain here during a campaign. 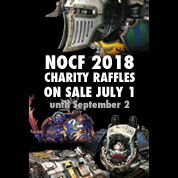 This book introduces a few new battalions with various nice bonuses – there’s even one for someone who has more than a couple of Bloodthirsters in their collection! 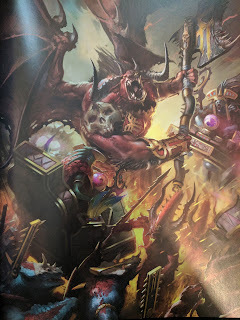 There are no new warscrolls but some of the existing ones have been tweaked and as a result in the back of the book there is a list of how many points each warscroll is worth like in the General’s Handbook (some of the points have changed to reflect the changes to the scrolls themselves). 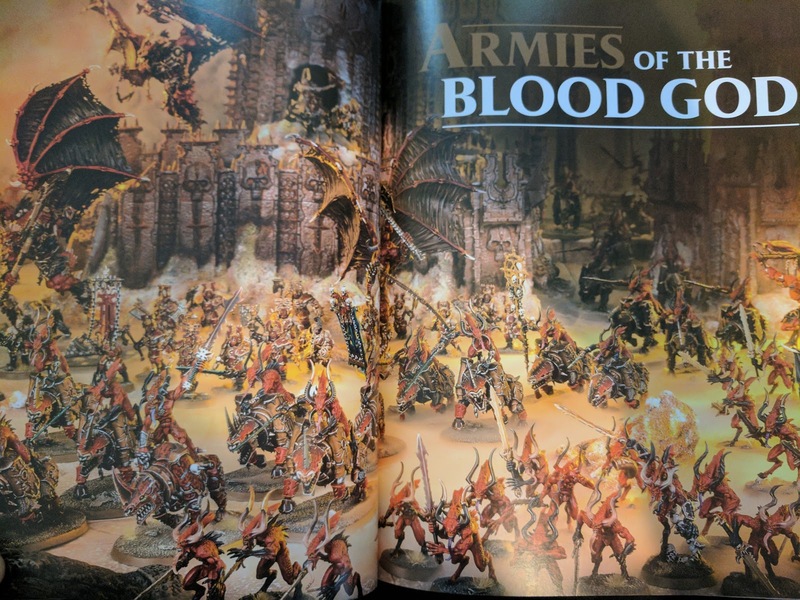 I feel this book is an excellent addition to the range and gives Khorne players a decent way to use to make their existing armies feel more like they are fighting for the Blood God and a brilliant template for them to use to guide them how they could expand their armies in the name of Khorne! BLOOD FOR THE BLOOD GOD! SKULLS FOR THE SKULL THRONE!!! Awesome overview! Khorne is my favourite chaos god by far! Sounds like they have received some cool new bits!